Availability: image posted online, e.g. BBC here and Huffington Post here. I'm Njong Emmanuel Tohnain, Cameroonian of nationality. I'm presently serving a 3 years imprisonment sentence in Qingdao City in Shandong Province of China since the 11th of May 2011 for an alleged charge of fraud with unfair and unsatisfied judgement. I've been molested and tortured physically, morally, psychologically and spiritually for all this while without any given chance to contact my family and friends. We are ill-treated and work like slaves for 13 hours everyday producing these bags in bulk in the prison factory. (Source: stateinspector 2014, np link). It’s the consumer-generation’s disturbing version of a message in a bottle (Source: McRae 2014, np link). 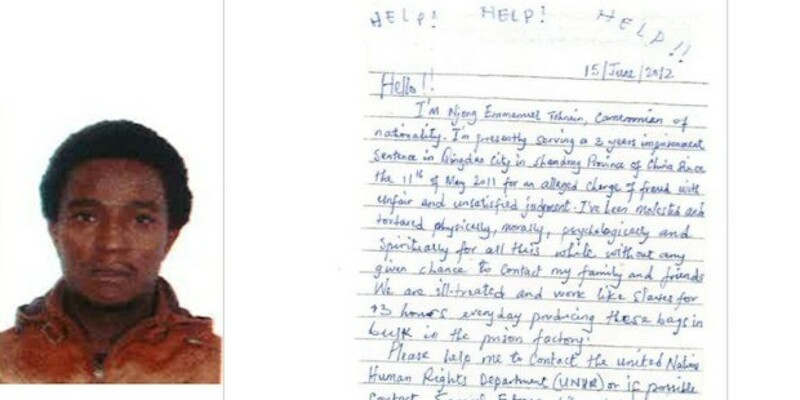 Imagine coming home from a store and finding a handwritten letter in your shopping bag - a letter written by someone who made that bag at a prison labor camp in China (Source: Porzucki 2014, np link). A simple shoe purchase at Saks Fifth Avenue turned into a human-rights uproar after the buyer found an apparent desperate plea for help from a Chinese prison-factory worker in her shopping bag (Source: Greene 2014, np link). A New York woman said she was left shaking after finding a letter inside a Saks Fifth Avenue shopping bag purportedly written by a man in a Chinese prison factory that was mass-producing the distinctive carry-all (Source: Chrisitie 2014, np link). Stephanie Wilson, an Australian living in West Harlem, was rifling through a Saks Fifth Avenue shopping bag for her receipt, when she found an SOS from a worker (Source: Perfecto Canlas 2014, np link). Stephanie Wilson bought a new pair of rain boots at Saks 5th Avenue, but instead of just a receipt in her brown bag she found a plea for help. The letter from Tohnain Emmanuel Njong was dated June 2012 and described the horrible working conditions where her shopping bag was produced (Source: Striepe 2014, np link). The message, written in blue ink on white lined paper, appeared to be a desperate cry from a man who said he made the bag while being unfairly held in a Chinese prison factory more than 7,000 miles away. The note, which Wilson found after buying a pair of Hunter rain boots at Saks in September 2012, was … accompanied by a small passport-photo sized color picture of a man in an orange jacket, she said (Source: Solomon 2014, np link). The letter … also included a Yahoo email address on the back (Source: Solomon 2014, np link). …in its urgency, [it] started higher than the ruled paper’s printed lines. ‘HELP! HELP! HELP! !’ a man had written, in blue ink on white paper. He opened, ‘Hello!! I'm Njong Emmanuel Tohnain, Cameroonian of nationality’ (Source: Greenhouse 2014, np link). … the letter read in part: ‘I've been molested and tortured physically, morally, psychologically and spiritually for all the while without any given chance to contact my family and friends. We are ill-treated and work like slaves for 13 hours every day producing these bags in bulk in the prison factory.’ It ended with the sign-off, ‘Thanks and sorry to bother you’ (Source: Chaplin 2014, np link). I read the letter and I just shook,’ Wilson told DNAinfo.com. ‘I could not believe what I was reading (Source: Wilson in Bonghi 2014, np link). Njong, a Cameroon national … was arrested on accusations of fraud while teaching English in Shenzhen, China. It was a crime he said he never committed, and he ended up serving a a three-year prison sentence in the eastern Shandong province. He sewed clothes, put together electronics, and made bags. Njong tucked letters in the products he was making, telling the New Yorker, ‘If someone could ever hear me somewhere, maybe somebody, in the course of using, could come to the letter and come to my rescue’ (Source: Chapin 2014, np link). Njong said each prisoner was required to meet a daily production quota of what they working on - bet it shopping bags, electronics or sewing garments - and that they were given a pen and paper to record their productivity. This is what he used to pen the letters, hiding under his covers at night so no one would see (Source: Chrisitie 2014, np link). … he had worked long hours in the factory … from 06:00 until 22:00. The 34-year-old said he wrote a total of five letters in both French and English calling for help. ‘Maybe this bag could go somewhere and they find this letter and they can let my family know or anybody [know] that I am in prison,’ he added (Source: Anon 2014, np link). He said he wrote 5 letters, some in French, but the one that made its way into Stephanie Wilson's Saks bag was the only one found (Source: Hathaway 2014, np link). Njong placed his French letters in the shopping bags that he made for French brands and he put his English letters in the bags with English brands. ‘How many letters are we actually missing, who knows who else is out there from any numerous countries that are writing these letters crying out for help?’ said [journalist Serena] Solomon (Source: Porzucki 2014, np link). Wilson contacted the Laogai Research Foundation, a Washington, D.C.-based advocacy group established by a survivor of a Chinese slave-labor camp (or laogai) named Harry Wu. Over the following months, the foundation’s legal arm and Serena Solomon, a reporter from the local-news Web site DNAinfo, located Njong’s attorney and his newly activated Facebook account. (He was released from prison last year.) Together, they were able to contact Njong and verify that he had written the letter and determined - based on their investigations online and in China - that the details of his account checked out. (They are also consistent with other accounts of prison labor, Cole Goodrich, the legal consultant at the Laogai Foundation, told me.) The Laogai Foundation identified the company that exported Njong’s shopping bags to the U.S. as Elegant PrinPac. That firm touts its work for Calvin Klein and Polo, its ‘environmentally friendly products,’ and its ‘quality management system.’ (Elegant PrinPac has not replied to requests for comment) (Source: Greenhouse 2014, np link). After handing the letter over to Laogai Research Foundation … the search for the man stalled and the information they’d gathered was passed on to the Department of Homeland Security. The fact that the search hit a wall when it was sent to the DHS, or that it was even sent to an American agency that would rarely intervene in China at all, shows just how unaccustomed we are to dealing with situations like this (Source: Roffee 2014, np link). ‘I know it sounds like a needle and a haystack type story but it actually isn’t,’ said [DNAinfo journalist] Solomon. ‘Tohnain Emmanuel Njong supplied an email address [on the letter] that linked to a Facebook page.’ From there Solomon was able to track down Njong’s friends and family, and eventually Njong himself. Njong was incredibly surprised when Solomon got in touch with him. He had been released from prison late last year after spending nearly three years in a prison labor camp manufacturing items such as the shopping bag in which Wilson found his note (Source: Porzucki 2014, np link). Prior to his conviction, Njong served 10 months in a detention camp, awaiting help from a legal aid lawyer. The lawyer, who represented Njong at trial, confirmed the former prisoner's story to DNAinfo. Njong was unable to contact his family during the entire ordeal, and they were shocked when he returned home alive, so he was understandably surprised to learn anyone had received his message. ‘It was the biggest surprise of my life,’ he said. ‘I am just happy that someone heard my cry’ (Source: Hathaway 2014, np link). In a two-hour phone interview, a man who identified himself as Njong said he wrote the letter during his three-year prison sentence in the eastern city of Qingdao, Shandong Province. Unprompted, Njong described obscure details in the letter, like its mention of Samuel Eto'o, a professional soccer player on English premiere league team Chelsea, who like Njong is from Cameroon in West Africa. (Source: Solomon 2014, np link). The Saks 5th Avenue incident is especially eye-opening because there's a perception here in the U.S. that these high-end companies treat workers better and use better materials. You'd expect that when you're paying premium prices for designer goods that some of that extra money makes its way down the supply chain to laborers, but that's generally not the case. Forced labor and sweatshop labor among designer brands is just as common as with fast fashion brands (Source: Striepe 2014, np link). Even products as inconspicuous as a paper shopping bag are often made at the expense of #workersrights (Source: KZanetta 2014, np link). Thank You Jesus, for allowing this note to be found, please free these people and keep this man and others like him safe (Source: LovinUSA 2014, np link). We should launch a ‘NO PENS FOR PRISONERS’ campaign (Source: anonymous 2014, np link). Chinese prisoners can be so thoughtless, scrawling their desperate pleas for help on scraps of paper and smuggling them into our beautifully oblivious American homes, hidden inside the cheap, disposable products that we so desperately need… Not even for a moment do they consider the temporary sadness that might result as we’re forced to reflect on the consequences of our insatiable gluttony (Source: Maynard 2014, np link). Now it's time for you to sit back and enjoy your life while the slaves work 14 hours to make the next product you want to purchase in the next few months (Source: Nibiru Bluestar 2014, np link). Njong … took the brave and desperate step of exposing the dreadful forced prison labor working conditions. It is a heart wrenching example of how the products we purchase, even those as inconspicuous as a shopping bag, are often made at the expense of workers' rights worldwide (Source: KZanetta 2014, np link). A great reminder about the conditions workers suffer in order to satisfy Western consumer desires (Source: _nyc 2014, np link). Yes, because only evil Westerners have consumer desires. At the heart of your sentiment, which is masquerading as a liberal, enlightened concern for the plight of those in poorer countries, is a tacit assumption of Western superiority. You don't see it because you have been raised in a Western culture, and educated by people who think they are progressive just because they know that the stuff they buy comes from people who don't have the same cushy lives as they do. But here's why that sentiment is actually pretty ethnocentric: Westerners are assumed to be the only ones who have the power to force the poor brown people of the world to work for little money. And Westerners are enlightened enough to stroke their goatees and feel bad about it. Westerners are, therefore, the most powerful, important people in the world, and also the best, from a moral standpoint. Furthermore, it doesn't even make sense in this case. These are paper bags. They aren't ‘Western consumer desires’; they are a commodity used in every country on the planet. The fact that these particular bags had a Saks logo on them doesn't mean anything. You can't argue that Western largesse is destroying these peoples' lives when the product in question is a paper bag. What we have here is Chinese people abusing Chinese (and, evidently, some other nationalities') people. When the company that ordered the bags (which probably wasn't Saks; they probably buy them from a US distributor who outsources manufacture to China), they didn't say, ‘And make sure you use slave labor to make them! We revel in the misery of Asiatics! Muh-hahahahahahah!’ No, they said, ‘How much to produce these bags? Okay, deal. Thanks.’ Westerners are not to blame for China's terrible track record for human and worker rights. To believe that they are is to assume Western supremacy and Chinese inferiority and weakness. No. These things happen because China is strong. It's strong enough to enslave its own people for the benefit of whom? The wealthy Chinese elites. 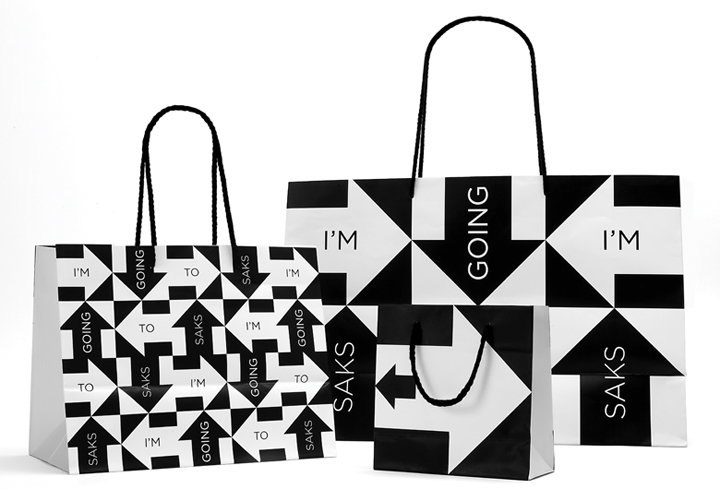 Saks isn't raking in the dough over paper bags. These are losses to them. … I reject all Western self-flagellation over the plight of workers in foreign countries. It's just masochistic masturbation, as though being aware of the issue and crying crocodile tears over it absolved one of the guilt associated with the fact that all your purchases are created by slave labor. Slavery never died; it just moved out of sight. Food is harvested and processed by illegal immigrants with no rights, who can be deported at a moments' notice and never be paid. Your clothing is stitched together by children in Bangladesh. The coffee and chocolate you enjoy was produced by actual, honest-to-god slaves in malarial hellholes. The computer or phone/tablet you posted from was built by workers at Foxconn or similar (regardless of the brand) working long hours with no vacation and living in cramped dorms on the factory campus. There is always a slave in the system, and you can either learn to live with that reality, or you can move out into the woods and live on tree bark and rabbit entrails. To sit here and pretend to be shocked every time you hear one of these stories, but continue to buy computer hardware, food, clothing – anything - is the very picture of hypocrisy. Wanna do something about this? Refuse to buy anything ever, unless you can determine the origin of all the components and the conditions under which they were manufactured or otherwise produced. Convince everyone else to do the same. Return to a subsistence agrarian lifestyle. And then see if you still have the time to stroke your goatee about the plight of Chinese prisoners. Your sham social conscience is the luxury of someone who lives on slave labor. You are not better than anyone. You just live in a rich country. If history had shaken out just a little bit differently, it would have been you working in the hellish factory and Chinese people tapping out their impotent rage about your lot in life on computers you will never see or afford. (Source: kylearm 2014, np link). That's seriously absolutist. You can still accept a system while believing it's not perfect, and needs to be improved. Here's what you do: Buy fair trade when possible, and if it isn't, buy whatever's closest to fair trade. Meanwhile, push for more fair trade stuff. This is how the free market works - you be the demand. Slavery isn't inevitable, unless everyone accepts it as such, and nobody ever bothers to push for change (Source: [deleted] 2014, np link). This whole diatribe is a ludicrous straw man argument (Source: Dannoco 2014, np link). The bottom line is that our entire system is f%±ked, and, as much as we might like patting ourselves on the back, and explaining to other countries how we got rid of slavery 150 years ago, the truth is that we’re still the beneficiaries of slave labor. We just make sure that we don’t see it any longer (Source: Maynard 2014, np link). What an eye opener. How can we even begin to compete with a country that produces its goods with the misery of forced labor? We have as a nation sold our souls to the devil for cheap consumer goods (Source: Shortshanks Viewminder 2014, np link). The irony is you sold your soul to the devil as well like the rest of us. Remember, you got to this page by using the product that was made in China by these very same slaves (Source: Nibiru Bluestar 2014, np link). I suppose you are typing your comment with a typewriter (Source: Freedom 2014, np link). Don't purchase goods made in foreign countries if you can. We are only enriching other countries while we, the US, becomes poorer and poorer (Source: Chris B 2014, np link). Very simple solution. ANY company conducting business in the U.S., if their product is NOT being made here BAN them! (Source: Rebecca V. 2014, np link). And how am I supposed to buy Champagne, or Italian marble, or many food products? (Source: Childers 2014, np link). Ever tried that? Even American made products might have some Chinese parts in it. My American Made bicycle has Chinese made parts on it (Source: ExCTCitizen 2014, np link). … this is why both Americans and British should be making their own products. Bring back our own factories to our own unemployed. Yes it will cost more, but then we will have employed people who could actually afford to buy our products. I can remember when I could buy a shirt made in the USA and it would last for a couple of years because the material was thick and strong and the fabrication was solid. Now I'm lucky if it last for more than a few months. What is so wrong to have both a highly educated and a highly skilled class economy. Oh wait, CEO's and companies don't want to pay taxes and employees a living wage (sarcasm). (Source: Tiffer 2014, np link). One thing is to boycott Chinese products but that presents some real hardships. I have a friend in LA who is doing that. She doesn’t have a toaster because the cheapest American made toaster she could find cost $300 and she can’t afford it. Unfortunately we have allowed quite a lot of our domestic manufacturing to go by the wayside to the point where anyone trying to avoid these items as a consumer has huge additional costs, both directly in price but also indirectly in terms of time to research and find domestic products. One answer is to pass laws which forbid the importation of any goods manufactured anyplace that doesn’t have decent environmental laws and a good minimum wage. Good luck with that. Heck, even buying items labled ‘Made in USA’ doesn’t mean that the goods were actually manufactured in a place subject to the standard minimum wage laws. My brother works for the GAO and he was just working on a report about the manufacturing that is going on in places like American Somoa, Guam, and Saipan. It isn’t slave labor but the workers get paid a lot less than the federal minimum wage. I am not sure if that is true of Puerto Rico too but I wouldn’t be surprised (Source: Lynne 2014, np link). Two U.S. laws make it illegal for products made using slave, convict or indentured labor to be imported into the United States, according to Kennedy. While I do not believe in the slave labor of China and other countries, our country also pays a very low wage to prisoners while having them work to make U.S. license plates, eye glasses and other products that we as Americans are charged an outrageous amount to purchase (Source: Kemer 2014, np link). American Prison Industries manufactures most all of the office furniture found in American Government offices (Source: Bigrod54 2014, np link). You are one sick commie (Source: TheDogDidIT2014, np link). As an aside, I found this remark amusing:  ‘Two U.S. laws make it illegal for products made using slave, convict or indentured labor to be imported into the U.S., according to Kennedy.’ The United States makes it illegal to import goods made using convict labour, but exporting and domestically consuming goods made using convict labour is a-okay! ‘Indeed, the 13th amendment includes a very plainly-worded clause which provides an exception to slavery in the form of penal labour.’ Neither slavery nor involuntary servitude, except as a punishment for a crime whereof the party shall have been duly convicted, shall exist within the United States (Source: network_nomad 2014, np link). The way prison works in China is that inmates have to literally earn their keep. While I have no idea if whatever is produced actually pays for the cost of incarceration, I’ve read (only from English-language sources, owing to the limits of my Berlitz-acquired conversational Chinese skills) that meals are served, contingent on individual production quotas (Source: Zhang Fei 2014, np link). American corporations contract with private prisons in this country for contract labor. We call it Capitalism. They call it Communism. It's just semantics (Source: Celli 2014, np link). It would be nice to have a tag or sticker on a product that states ‘this product and all its components have not been built using prison labour’ (Source: runwithscissors 2014, np link). Program coordinator for China Labor Watch Kevin Slaten told the New Yorker that American corporations use a convoluted system of contracting and subcontracting that is designed ‘in a way that allows them to plead ignorance’ about labor problems. The International Labour Organization estimates that at least 12.3 million people around the world are victims of compulsory labor (Source: Chapin 2014, np link). Homeland Security officials confirmed to DNAinfo that they were made aware of the letter, but could not say if they investigated it or are currently looking at Saks in connection to it. A DHS official said it's not the first plea letter from China that has ended up on American shores. According to DHS senior policy adviser Kenneth Kennedy, the department was made aware of a woman in Oregon who made international news in 2012 when she discovered a similar letter detailing abuse and grueling labor in a Chinese prison when it fell from a Halloween decoration she'd bought at Kmart [see our page on this letter here] (Source: Christie 2014, np link). … investigations are difficult with DHS required to prove how much a company knew about its own supply chain. ‘Was there actual knowledge (of slave, convict or indentured labor?) Or was there knowledge that they avoided knowing or seeing?’ [senior policy adviser Kenneth] Kennedy said. ‘All that plays into the investigation.’ A legal clause known as the consumptive demand exemption, which Kennedy referred to as ‘the Achilles heel of these laws,’ can also greenlight imports regardless of the type of labor used if domestic consumption cannot be met otherwise (Source: Solomon 2014, np link). Shame on anyone buying these overpriced products produced in the most oppressive and inhumane work conditions ... Get a bloody conscience people! (Source: null 2014, np link). Ultimately, preventing labor abuses and developing basic transparency in the supply chain is a mission we must pursue together. Success first and foremost requires governments to enforce labor laws that meet United Nations (ILO) standards. Success depends too on farmers, factories, brands, retailers and everyday shoppers like you and me to call for and invest in the effort to rout abuses from their purchasing. To protect people like Tohnain Emmanuel Njong, workers themselves need to know their rights under the law and their universal rights, and they need effective grievance systems in the case of violations (Source: KZanetta 2014, np link). Stephanie Wilson [is] Senior Project Manager at Social Accountability International (SAI). The perfect person to find the note, Stephanie possessed the determination, the knowledge of international labor rights and the savvy to trigger a series of events leading to DNAinfo locating the author, a man from Camaroon now released from prison and working in Dubai (Source: KZanetta 2014, np link). What a con man this chap must be. None of it rings true at all (Source: selfemployed 2014, np link). THIS STORY IS A PUBLICITY STUNT AND A HOAX! COME ON, PEOPLE! Wilson has worked for the nonprofit Social Accountability International for the last four years. So she works for an organization whose mission is to advance the human rights of workers around the world. AND SHE JUST SO HAPPENED TO FIND THIS NOTE? WHAT A DAMN AMAZING COINCIDENCE, and got all this publicity for persecuted workers! REALLY? come on …, do your homework! (Source: tnlawgirl 2014, np link). I am going to sound ignorant and say he does not look Chinese to me (Source: [suspended user] 2014, np link). This guy is an African and it’s either a scam, or it’s a hoax by some class-warfare loving lefty to guilt rich people into not shopping Saks. SCAM SCAM SCAM Pretty shrewd (Source: gaijin 2014, np link). This is just the latest twist on the ‘General Mombutu bids you kindest warm salutations in the highest confidence, and asks you for cooperation in sensitive banking matter, though your commission will sadly be limited to only FOURTEEN MILLION U.S. DOLLARS.’ And most people don’t realize that that is an African variation on a scam that dates literally from the French Revolution, the ole, ‘I am a deposed French royal stuck in a Spanish prison, and I need a small amount of money to get out of jail and later access my enormous gold fortune, spirited out of pre-Revolutionary France’. Yeah, that’s where those guys in Lagos got that - they didn’t even make it up, not really. And even THAT scam is a twist on another one that goes back several hundred MORE years (Source: gaijin 2014, np link). I don't doubt China does all sorts of awful things and I'm not defending them I'm just sceptical of this particular story. Others have mentioned how it's odd that he'd include a picture of himself and I would add that the handwriting in the letter looks impressively proficient. It also has a style that looks very similar to how many American women handwrite (Source: AndrewCarnage 2914, np link). He is an educated man who was born in Camaroon, speaks (at least) English and french, and was working as a teacher. I don't have a problem assuming he has good handwriting, especially since the grammatical errors are consistent with a non-native English speaker (which is actually difficult to fake). Why would you even question this? Who benefits by making it up? The woman who found the letter over a year ago, or the non-profit tasked with exposing abuses in Chinese labor camps run by a former prisoner of said camps? Give me any reason to question a story that even the USDHS [Department of Homeland Security] confirmed. And even if you proved 100% it's fake, so what? Would that suddenly mean China is clearly not using forced labor and sweatshops? I don't understand people like you that try to ‘debunk’ every claim anyone makes despite the fact that doing so won't improve anyone's life and only proves to make you feel superior to all the ‘idiots’ that fell for such a clearly bullsh*t story. Your brand of rampant uncontrolled cynicism is just sad (Source: feynmanwithtwosticks 2014, np link). I found a note in a Chinese Fortune Cookie at the Peking Moon almost like that. I took the note to the Chinese Embassy in Washington, DC and asked them to help him. They said they’d look into the matter. That was 30 years ago and I haven’t heard from them (Source: TaMoDee 2014, np link). This isn't play on the old joke about a message found in a fortune cookie that read ‘Help, I'm being held in a Chinese Fortune cookie factory’ is it? (Source: Robe 2014, np link). I used to work at Kerrville State Hospital. I would get donated items from Volunteer Services for prizes for games with the patients. One donated item was a wooden keychain bearing the words ‘Help, Get me out of here’. The keychains were made locally at a ranch… later named the Ellebracht Slave Ranch when it was discovered the owner picked up hitchikers, and enslaved, even murdered them for free labor. It wasn’t until later when the slave ranch was exposed that I wondered if the maker of the key chain was issuing a cry for help (Source: sockmonkey 2014, np link). I’m living in constant fear, always worried that my next dollar store purchase could be the one with the inevitable, ‘I hope you like this porcelain figurine, I’ve lost vision in one eye due to the beatings’ letter inside (Source: Maynard 2014, np link). I've heard of other letters like this before smuggled out of China. Would be great to compile a list of these letters and have them documented on a website or a news story done on them. Very cool concept for worker's justice and human rights (Source: Orangutan 2014, np link). It … should get us all thinking about where our luxury goods really come from, and gives a whole new meaning to the term ‘free with purchase’ (Source: Gregory 2014, np link). Stories like these remind us of the human cost of our clothing, and why being a conscious consumer is so important in this day and age (Source: Roffee 2014, np link). Although it may not have been entirely Njong's intention to bring awareness to the reality of what may be going on in factories around the world, it certainly made an impact (Source: Hoefler 2014, np link). Wilson, who has never spoken to Njong, said she thinks about his plea for help all the time. She had always been mindful of the products she purchased and where they were made in a bid to avoid sweatshop labor, but she never thought to worry about generic products like shopping bags. Wilson has worked for the nonprofit Social Accountability International for the last four years. ‘This has been the biggest eye-opener for me,’ Wilson said. ‘I have never once thought about the people making my shopping bag or other consumable products like the packaging of the food I buy, or the pen I write with or the plastic fork I eat my lunch with.’ (Source: Solomon 2014, np link). Tiffany Bourré, a spokesperson for Saks and its owner Hudson's Bay Company, told the New Yorker they had investigated the matter but the results were inconclusive because of ‘the lack of information and significant time delay between the discovery of the letter by the customer and notification to Saks more than a year later.’ The company prohibits slave labor and uses surprise audits to prevent its use, though Bourré told the New Yorker that nothing had changed with the supply chain in response to Njong's letter. However, some policies may change as part of its integration into Hudson's Bay (Source: Chapin 2014, np link). Bourre … [said] that they had heard about the letter and are now ensuring all vendors meet their zero tolerance policy for forced labor (Source: Perfecto Canlas 2014, np link). 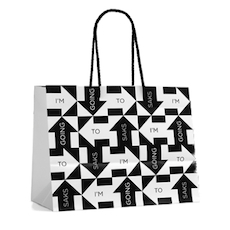 Bourre said Saks does have its paper shopping bags made in China, but the company was unable to determine the specific origin of the bag that contained Njong's letter and photo (Source: Solomon 2014, np link). Finally released after three years and put on a plane back to Cameroon, where his family had assumed he was dead, Njong is now living in Dubai, where he has secured a new teaching post (Source Anon, 2014b np link). I asked about whether he might be compensated for his troubles. Doesn’t China owe him? Don’t any of the others along the supply chain that brought the bag into Stephanie Wilson’s hands? ‘I don’t think the hours are worth it, seeking compensation,’ he said. ‘It’s not easy. It’s not something anybody can just do’ (Source: Greenhouse 2014, np link). Think hard - if you find a plea for help, what will you do? Would you throw away Njong's letter? Or, as Stephanie [Wilson] did, will you put in the effort to protect those who make the goods you buy? (Source: KZanetta 2014, np link). Hoefler, A. (2014) Plea for Help Found in Saks Bag. Fashion Times 29 April (http://www.fashiontimes.com/articles/6032/20140429/plea-help-found-saks-bag.htm last accessed 20 June 2014). 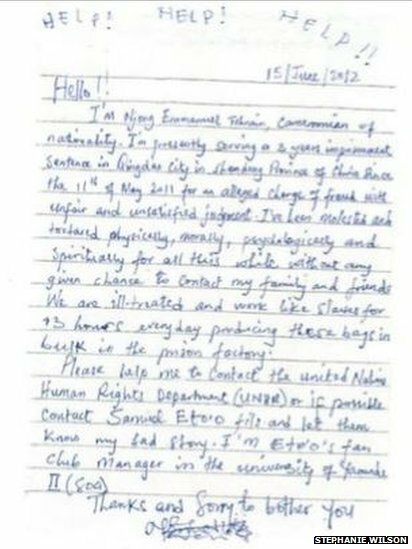 Kemer, L. (2014) Comment on Solomon, S. (2014) Saks Fifth Ave. Shopper Finds Prison Laborer's Secret Cry For 'HELP' Inside Shopping Bag. Huffington Post 29 April (http://www.huffingtonpost.com/2014/04/29/saks-fifth-avenue-chinese-worker_n_5233589.html?ncid=fcbklnkushpmg00000015 last accessed 20 June 2014). Page compiled by Will Kelleher - as part of a followthethings.com internship - & Ian Cook (last updated June 2014). Product photo categorised as ‘labeled for reuse’ on Google image search, 25 June 2014, taken from here.